Another basic card – this one has Happy Birthday on the inside. 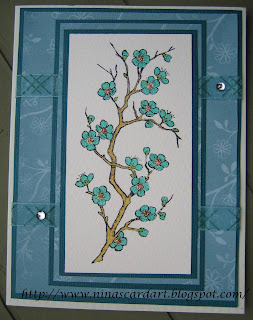 I colored this stamped image with my atyouSpica glitter marker then used Aqua Stickles for the center of the blossom. Supplies: Cream and turquoise cardstock, Designer Paper – Close to My Heart, Rubber Stampede – Cherry Blossoms, ribbon and gems. I have been feeling a little under the weather so I have not done much in the way of cardmaking the last couple of weeks. I hope to get a few done this week then I will probably have another dry spell as we move along into summer. 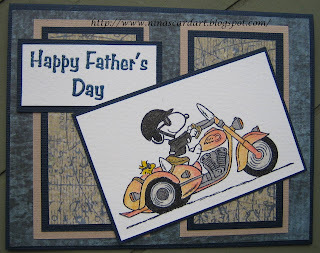 This is the Father’s day card I made for my husband, he loves motorbikes so I am always trying to find something new for his cards. I found some wonderful Snoopy and Peanuts stamps to use for the next few. This card was pretty basic card to put together, at the time though I was stretching my imagination as I was not feeling very creative. In fact it took me a few sit downs to get it all together but I was happy with the end result. I was lazy about setting up the light tent though so the picture is not the best. 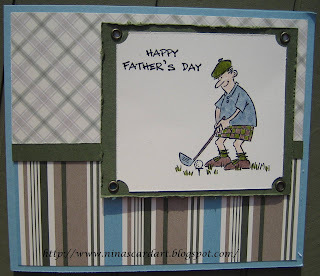 Supplies: Blue and tan cardstock, Designer paper – Memory Stor, Stampabilities – Snoopy Chopper, Great Impressions – Happy Father’s Day. I did not get a chance to post a card today. One of the blogs I follow pointed me in the direction of this blog though, I think it is so cute. Check out My Milk Toof. Another workshop card, not sure what happened in this picture as it makes the card look odd. Our sun seems to be in hiding behind some low cloud but it is still suppose to still be nice, I am on the move and heading out to enjoy and do some running around. 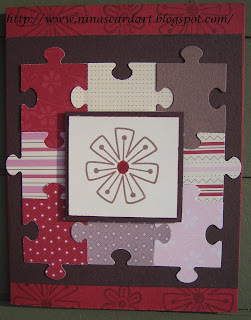 Basic can be great, this is another card from the previously mentioned workshop. I am so glad it is Friday, this was a long week. "Fore" all those golfers out there.... 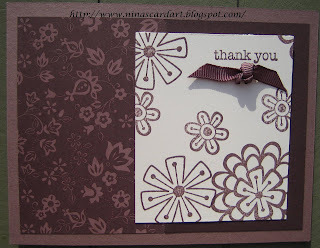 This is another sample from the Stampin' Up! workshop I attended last weekend. Have a great day... wear sunscreen. Good Morning - It is Hot on the island this week, yesterday it was a balmy 28 without wind a definate record breaker for the beginning of June for us. 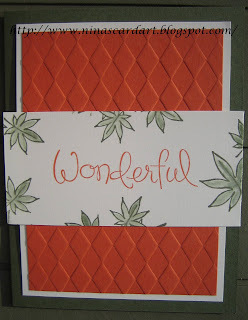 This is the first card in the series from my Stampin' Up! workshop this past weekend. Just a quick card for my son’s music teacher. 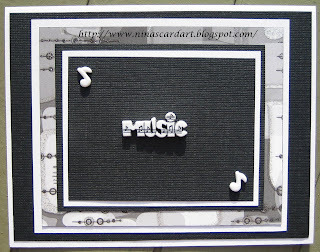 I used multiple layers of cardstocks then finished this card with three little buttons, two music notes and Music. I have been lazy with taking the pictures of the cards, I would rather prop them up outside then set up the light tent, so there are a few shadows. Supplies: White and black cardstock, Designer paper – DCWV The glitter Stack, Dress it Up – Musician – Jesse James buttons. We are suppose to get tons of sun today, if you are too Enjoy. Another start of a week, I hope a great weekend was had by all. I attended a Stampin’ Up! workshop yesterday and I will show you the resulting projects a little later this week. 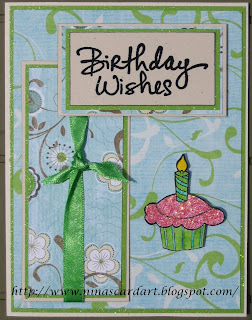 This was a simple fun card, I have been wanting to use this cupcake stamp since I got it. I colored it with my atyou Spica glitter markers. The cupcake icing I did multiple layers of Stickles to get the look I wanted. I did end up with more glitter covering my fingers and capri’s then I did on the cupcake I am sure, all in good fun and my Survivor Bootcamp instructor was suitable impressed with glitter covering my workout clothing :). I love the designer paper by BoBunny, it is double sided and both sides are great. The card is bright but cheerful, I just had to add the brilliant green glitter paper, then match the ribbon and the glitter marker. Supplies: Cream cardstock, green glitter designer paper-DCWV , BoBunny-Abbey Road Sky-designer paper, Birthday Wishes-Stamp-it, Sarah Beise-Cupcake, Misc green ribbon, Stickles-Fruit Punch.